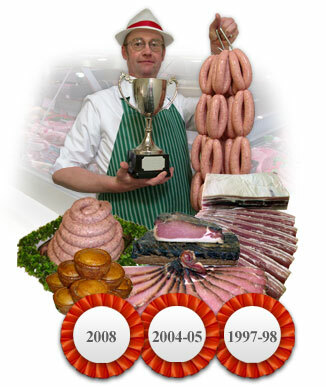 We’re a high class family run butchers in the popular Lake District village of Windermere. Home of the authentic traditional cumberland sausage. There has been a family run butchers on the site since the 1880’s. A.F. Huddlestons was formed in 1945 and moved into the current premises in 1977. We pride ourselves in the care taken in the production of our bacon from the selections of the breed of pigs used to the type of cure (sometimes including carefully selected other ingredients which add to the flavour) to the way it is cured, right through to the slicing and packaging. All our bacon is rindless and our attention to detail is immense but the result is quality, award winning products and consistency is everything. You will not find any of our bacon or sausages on the shelves of supermarkets - quite simply because, we believe, mass produced food loses its identity. We produce everything by hand using old-fashioned methods but using cures for modern tastes. At our Windermere shop we also provide quality local meats including lamb, poultry, pork and beef. We use locally sourced ingredients to produce our own award winning Bacon, Sausages and Pies which we have become famous for.